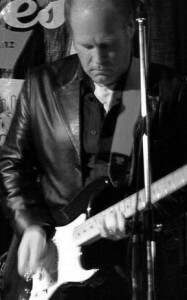 DEL THOMAS BAND ~ CD Release Party – Capital Blues Inc.
Del Thomas has been playing guitar since he was a kid, having watched the Beatles, Stones and Kinks on TV back in the black and white 60’s. In the early 70’s he was bitten by the singer songwriter bug and his record collection filled up with Cat Stevens, Sutherland Brothers and Richard Thompson albums. Then he heard the original Fleetwood Mac’s Greatest Hits and Eric Clapton’s 461 Ocean Boulevard album and discovered the blues. From there, his interest in a wide range of styles expanded, including The Eagles, Poco and Lynyrd Skynyrd to Bonnie Raitt and Ry Cooder but the roots of his interest remained in the blues, folk and alt-country (before it was even called that). Having played with a few covers bands in Scotland, he moved to NZ in 1995 and after arriving in Wellington, developed his playing and song writing skills with his own pop/rock band called Glass Onion. Glass Onion were reasonably successful, releasing a 4 track EP in 1997 (which got a fair amount of play on Wellington radio stations) and playing support for acts such as Collective Soul, The Exponents, Midge Marsden, and The Muttonbirds. Since then his blues-based covers bands, The Pukekos and SilverLine, have both played extensively around the Wellington area; The Pukekos scoring a slot on TVNZ’s ‘Good Morning’ programme in 2005. More recently Del set up Manalishi, a band paying tribute to the blues of early Fleetwood Mac and Peter Green. This band continues to gig around the blues clubs and summer festivals. Once again, Del is playing the music that first inspired him to pick up a guitar. However, the original material that he was writing was starting to build up. Having sent a couple of new demos to Roger Marbeck at Ode Records, he received enough positive feedback from Roger to back up the audience applause whenever he played the songs at gigs to convince him to do some serious recording and get the songs out to the world. So Del, along with drummer, Mo Phillips, bassist, George Barris and keyboard player, Bob Smith, went into Del’s home studio and laid down the basic live tracks for the new album. Del added a few extra guitar parts and backing vocals before polishing up the mixes. The end result of their efforts can be heard on Driving Home Alone. The lyrics have been crafted in a way that anyone who’s suffered and lost in love can relate to them – and haven’t most of us at one time or another? Despite many of the songs being about lost love and broken relationships, there’s not one of them that has a ‘woe is me, pass me another bottle’ feel to it! Even when the lyrics hint at dark times staring the listener in the face, Del presents the song with an up-tempo beat, catchy chorus and bluesy guitar hooks big enough to snag a snapper. Del Thomas has succeeded in creating cool radio-friendly songs that hint at a lot more to come from this song-smith with one foot in the blues and the other in country-folk-rock.